Of course, marketing teams know this: It’s why they spend the time first putting together their spreadsheets, and then, if they need to present that data, they take the time to create a Power Point or similar visual presentation. It’s why Google Analytics (and many other analytics solutions) offer visual reporting. The problem, however, is asking a non-design professional to spend valuable time and resources creating functional beauty that will get their point across to the executive board table with the hopeful result of keeping the marketing campaign budget and proving marketing ROI. According to the BBC, The human eye is one of evolution's greatest achievements. There’s probably no surprise that seventy percent of all sensory receptors are in our eyes. It’s not just that we primarily use our vision (over smell or taste or hearing or touch). In fact, only about 25% of us think exclusively in words and Steven Pinker notes that we are not born with language — more evidence that words are not evolutionarily our primary way of thinking. And even beyond the basics that we’re visual by nature, we humans love images. So much so that MIT neuroscientists found the brain can identify images seen for as little as 13 milliseconds. Wow. The thing is, that ability “indicates to us that what vision does is find concepts. That’s what the brain is doing all day long — trying to understand what we’re looking at,” according to Mary Potter, an MIT professor of brain and cognitive sciences and senior author of the study. Perhaps more to the point, as Le Corbusier wrote, “I prefer drawing to talking. Drawing is faster, and leaves less room for lies.” True enough. And when what the audience sees is exactly what you planned for them to see, you have done something close to alchemy. You’ve taken two disparate elements, combined them, and given the world something entirely different and better. Because data visualization is a kind of alchemy, a blend of art and science, therein lies the potential trap: the end result cannot be simply beautiful nor densely obtuse (and generally ugly). It needs to be both pleasing to look at while also communicating important insights effectively. The thing is, visualized data is often complicated, confusing, or boring. Possibly worse, with the rate required to churn out solid data in visual form, data, even in its simplest form, isn’t “cleaned” properly. Peter Donnelly does a wonderful job at gently letting us (well-educated, critical thinking types) know that we are horrid at understanding data but we’re possibly even worse at admitting this to anyone, including ourselves. There’s something quite freeing about being allowed to be excellent at one’s profession and finding support for the things which simply aren’t part of that profession. In the case of Peter Donnelly’s TED talk, he reminds us that, if a pediatrician had told a courtroom that they were quite good at building bridges and had actually built one that is on the route home from the courthouse, most people would not simply trust this. But that same pediatrician had effectively assured the courtroom that they were a data expert and had presented the room with false data which sentenced an innocent woman to prison. No one, none of the lawyers, no one questioned this expertise. That was in 2005. In 2018, things are arguably worse. The sheer amount of data has exploded and the need to wrangle it has crossed over into many job descriptions including many marketing professionals. 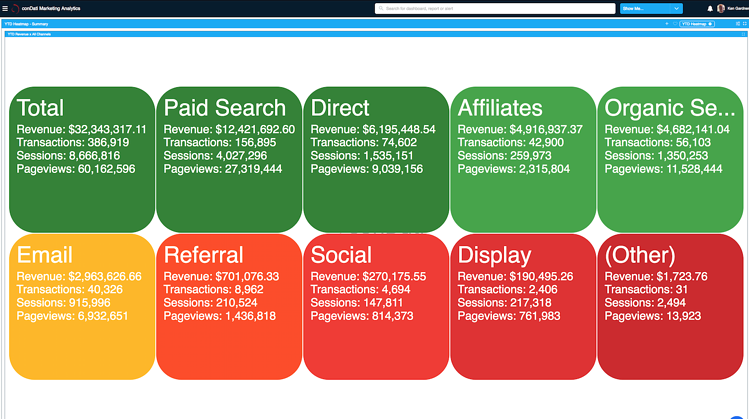 One of the key benefits to conDati Marketing Analytics is that we create dashboards for you. 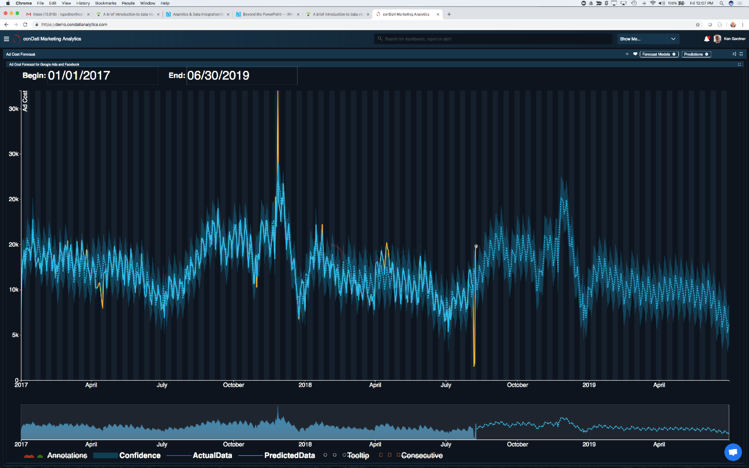 Our team has spent decades (and secured quite a few patents) perfecting the design of analytics dashboards. There are plenty of examples of poorly designed dashboards. For an excellent dive into the the (fascinating) depths of data visualization theory, see this article at MarketingLand. We are primarily visual. In fact, 70 percent of all sensory reports are in the eyes. Our eyes are so good (and so much better than the rest of our senses) that we can grasp a visual scene in less than 1/10 of a second. Color (even adjusting for those with color blindness) takes precedence over shade or shape. conDati has perfected the art and science of data visualization to bring the best research to your fingertips. Intuitive navigation that brings instant understanding to your entire team. The end result is that the marketing professional can easily find the reporting necessary, in a deeply intuitive way similar to a “Netflix-style” experience, to communicate the complicated insight they need to convince the executive board (or whoever holds your purse strings) that the the marketing budget is doing just fine, thank you very much (or maybe even needs a little increase…).